Any and all types of foundation products are always at the top of my "must-try" list. I absolutely love complexion products and feel they can make or break a look. I've recently been testing out a few different concealers and found three that I really enjoyed and wanted to share with all of you. Before these, I was really enjoying this one from Benefit as well as this cult classic from NARS, but after trying these three different formulas, I quickly added them to my routine. 1. By Terry Densiliss Concealer (bottom swatch) - By Terry's entire Densiliss line is absolutely magnificent (this blush in Platonic Blonde is everything) so I already had high hopes for this concealer. And it was every bit the luxurious and decadent concealer I expected. Out of all three, this is by far the creamiest and smoothest to apply. The formula does not settle into fine lines and wears beautifully whether my skin is dry or oily that day. The color (Fresh Fair) is the closest to my skin tone and in a pinch this can be used as a touch up for areas of redness or discoloration. It has a matte finish but surprisingly disappears immediately into the skin and is virtually undetectable. A definite splurge, but as is with most her products - worth every penny. Available at Space NK and Barneys. 2. 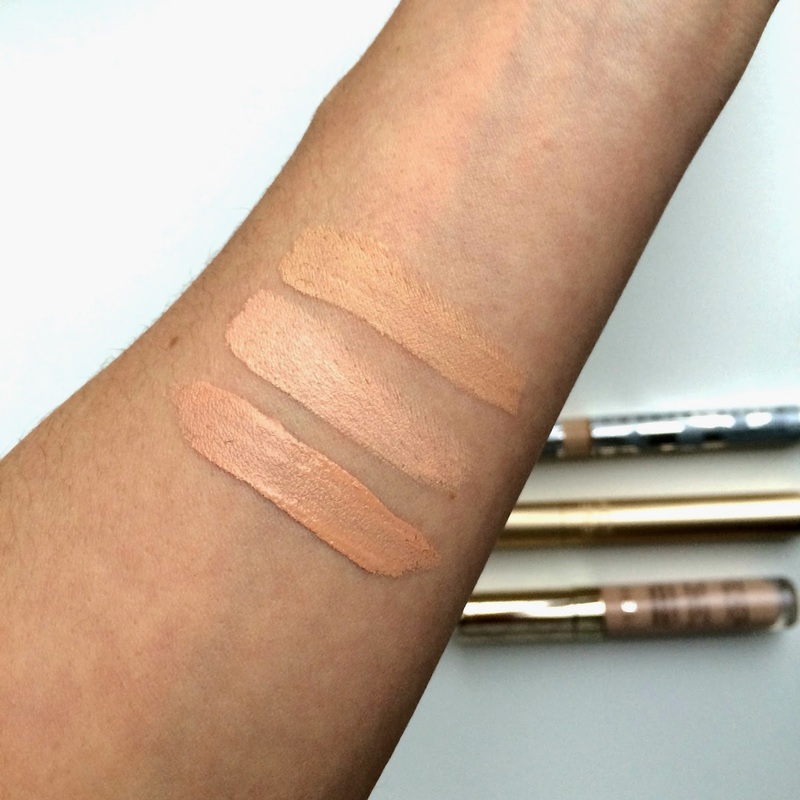 Eve Lom Light Illusion Concealer (middle swatch) - This concealer works more as a brightener for me and is perfect for those days when I don't want a ton of coverage but still need some lightness under the eyes. The formula is lightweight and has a pink undertone (my shade is Alabaster 1) so it does a great job for me of color correcting my dark circles without giving me that reverse raccoon look (when the concealer is too light - yuck). Because I loved the formula so much, I've begun using it highlight around different parts of my face and I think it gives a beautiful effect while adding some depth. I add it to my cheekbones, brow bones and around my lips to help them look a bit fuller. It's a great alternative to powder highlighters which can often add too much sparkle. This adds the brightness without any of the shimmer. Available at Space NK. 3. Chantecaille Le Camouflage Stylo (top swatch) - This concealer (my shade is #1) seems to be a mix of the other two - in the sense that it has a creamy formula that does a great job at covering while the light-reflecting pigments help to brighten any dark areas. Because of the skincare properties of this concealing pen, I reach for this when I have had a particularly restless night and my eyes are extremely dark , dehydrated and/or puffy. I see a marked difference almost immediately and it really soothes the under eye area and smooths it out. I've also begun carrying it with me during the day because I like the way it layers over my makeup, and find it never gets cakey and is perfect for touch ups. It's like my emergency fix-it tool. And we all need one of those, right? Available at Space NK, Bloomingdale's, Nordstrom and Saks. What is your current favorite concealer right now? Leave me a comment below! i really like the eve lom as well! !